These Simple Macerated Strawberries can be enjoyed as is or as a topping on yogurt, pancakes or cake. A taste sensation awakes you with these Macerated Strawberries. Well, if you do, you’ve come to the right place! As many of you know, I am from Quebec, in Canada. We can get amazing strawberries here locally – naturally sweet and tart and perfect – usually by the end of June. Until then, I’ll be transforming my sub-par strawberries into these Simple Macerated Strawberries instead. What exactly are Macerated Strawberries? Let’s start be defining the concept of macerated strawberries. I know the name sounds kind of… violent? But I assure you, the word “macerated” simply refers to a culinary technique that encourages a fruit to release its juices. You can basically use a simple sugar syrup to soften the food to draw out the natural juices. The syrup can also include alcohol as an ingredient (liquor, brandy, or even wine). Basically, macerating follows the same principle as marinating, where spices, herbs and liquids are combined with fish and meats. In both, the end result is an infusion of flavors. Today, we will be using this technique to obtain macerated strawberries. Once you realize how easy and tasty strawberries become at the end of this process, you can play around with adding all kinds of different herbs and spices to your syrup. (The version of the syrup that I’m sharing with you today is super simple and stripped down. Feel free to add to it as you see fit). And as far as choosing which fruit to macerate, anything goes! Try peaches, nectarines, raspberries, blackberries, or whatever else strikes your fancy. Today, it is going to be macerated strawberries. For breakfast lovers -this recipe for Simple Macerated Strawberries is great as a topping for French toast, pancakes, crepes, waffles or even cheese blintzes. 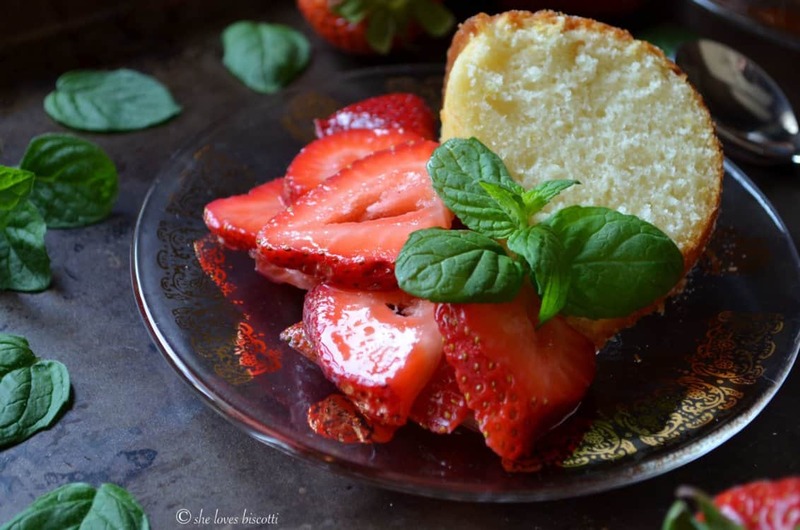 For cake lovers -these macerated strawberries are great with this orange chiffon cake or cheesecake, and naturally as part of a strawberry shortcake. 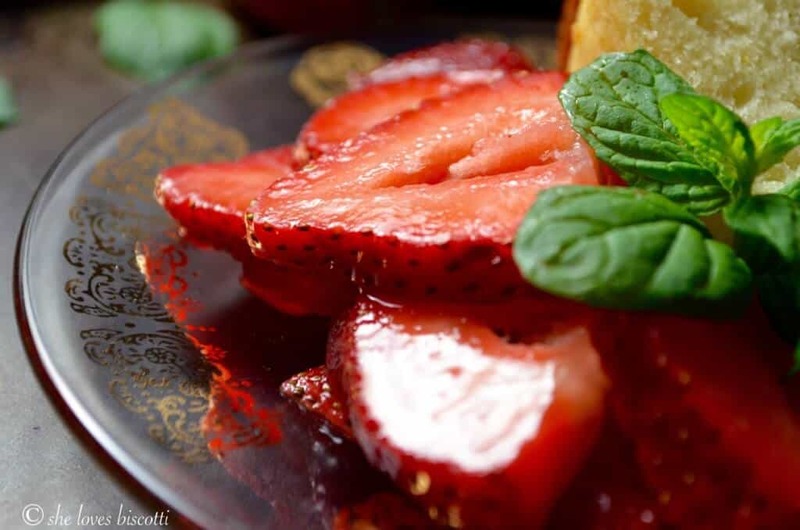 I love making this recipe for macerated strawberries to serve with my mom’s Traditional Italian Citrus Ring Cake recently shared with all of you. I think they taste great together! For dairy lovers -you can also use these macerated strawberries as a topping for yogurt, ice cream or even sweetened ricotta like this Easy Summer Berry Honey Whipped Ricotta Parfait. As you can see, these macerated strawberries really are very versatile, and make whatever you are eating that much more wonderful and enjoyable. As a mother (and a dietitian), I have always tried to encourage my kids to adapt healthy eating habits. Considering my personal beliefs and my upbringing (where I was taught that fruits make great desserts), it should come as no surprise that I have no problem getting my daily recommended servings of fruits and vegetables. 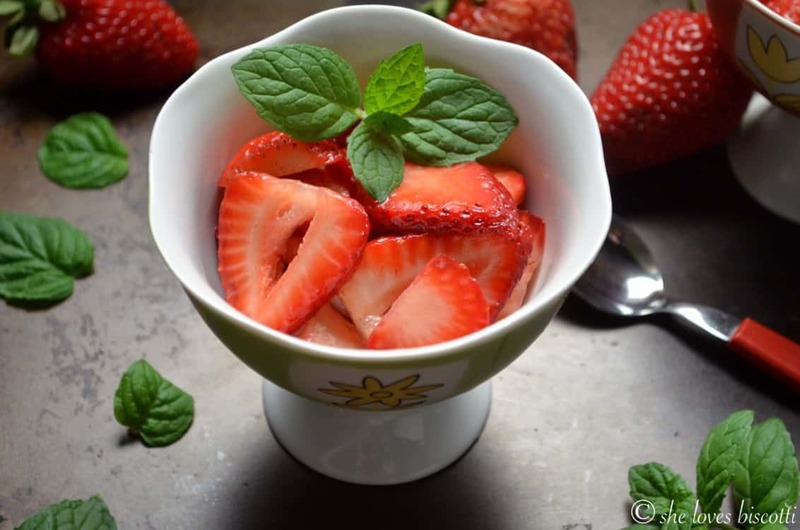 I could easily have all my recommended daily portions in just one meal, especially if strawberries are within arm’s reach… it takes a lot of willpower to stop eating those little jewels… thank goodness there are only 50 calories per cup of strawberries and that they are a terrific source of Vitamin C! One evening, a few decades ago, (where does the time go!!!) I had a nice bowl of strawberries that I had washed and prepared as “dessert” for my family. I will never forget the look on my son’s face when he took one bite and exclaimed that my strawberries were not as good as his nonna’s! So… many decades later, here I am telling you that I’ve come over the dark side. Whenever you have sour strawberries, just add a little, and I mean a little honey. That’s all they need to bring out their natural sweetness. And now you know how to make Simple Macerated Strawberries… nothing could be easier or tastier! In a small bowl, whisk together honey, lemon juice, lemon zest and mint (if using). Gently combine with the sliced strawberries. Leave at room temperature for 15-30 minutes. 2 cups of strawberries is the equivalent of 1 pint or 3/4 pound. For an alcoholic version: substitute the lemon juice with an orange liquor. 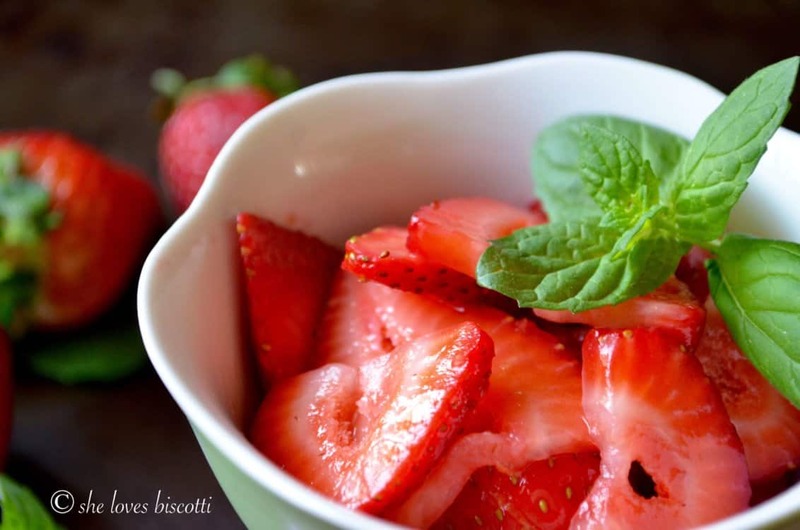 LOVE THIS MACERATED STRAWBERRIES RECIPE? PIN IT TO YOUR BRUNCH BOARD! A Canadian group of bloggers (all members of the Food Bloggers of Canada) have decided to share their love of strawberries with all of you. Look for us in all the social media by searching: #CDNFoodCreatives). A big thanks to our host Amanda, who can be found at The Cinnamon Scrolls… she’s the mastermind behind this collaboration. I’ve always made a version of macerates strawberries that is simply strawberries sliced and crushed with a little bit with granulated sugar, but I wanted a more “grownup flavor” to go along with the citrus ring cake, so I tried this recipe. I chopped the strawberries fairly small so that it could be more of a pour-over sauce. I can’t believe how wonderful they turned out. A lot of depth of flavor with out being cloyingly sweet as with just the sugar. This recipe is just as spectacular as the citrus ring cake! 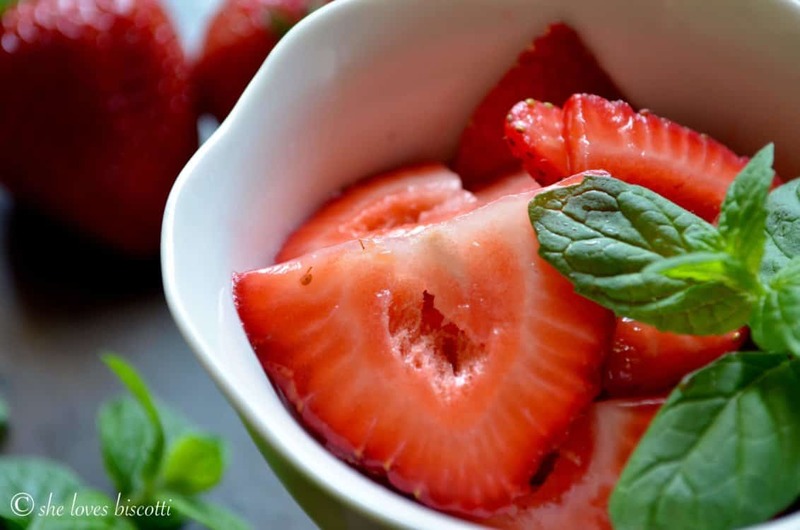 Can’t wait to try these macerated strawberries… they look so good! Thanks!!! Yes, they are great on their own or served with your favorite dessert. Appreciate you taking the time to comment, thanks! I love how simple and easy this recipe is. There’s really no excuse not to enjoy dessert, is there? The best part is that it’s healthy! 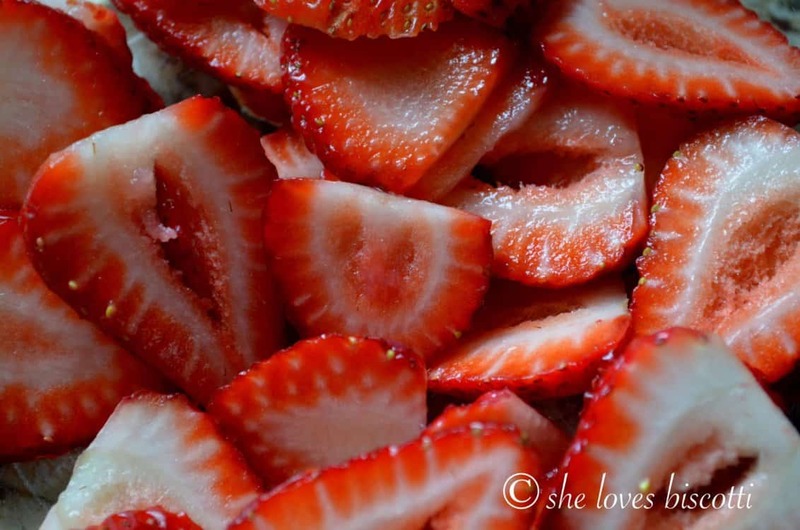 Macerated strawberries are so delicious and you can use them in so many different ways. Perfect way to enjoy fresh berries in season. Simple is sometimes better. Thanks for the reminder. Hia Deb… It doesn’t take much to make this gal happy 🙂 Thanks for dropping by. 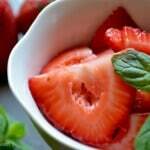 Agreed that macerated strawberries are a great topping for many many foods. I also like to top them with club soda for a nice refreshing drink. This is such a fresh and delicious way to enjoy strawberries…a little bit of honey makes almost everything taste just a little better! Your strawberries look beautiful and yes macerated is a rather violent word! I love to use fruit this way as well, simply prepared and delicious. I love macerated strawberries! I’ve been eating them all my life, especially when I’m in Rome and my dad makes them for us. He is really good, with sugar (he’s like your mother 😉 ) and lemon juice he turns a simple fruit into a scrumptious dessert. Thanks for sharing, Maria, and your citrus cake looks fantastic (another one of my favorites).